Shooting from the hip is a technique where one pulls the trigger without looking directly through the camera viewfinder. So why should you shoot from the hip when you can use the traditional method of looking through a viewfinder? Shooting from the hip, when the circumstance warrants it, gives the photographer the ability to follow a moving subject with the camera while keeping one eye on the subject and the other on the surroundings. This technique also allows the photographer to anticipate the subject’s movements and give the photographer more shooting time. 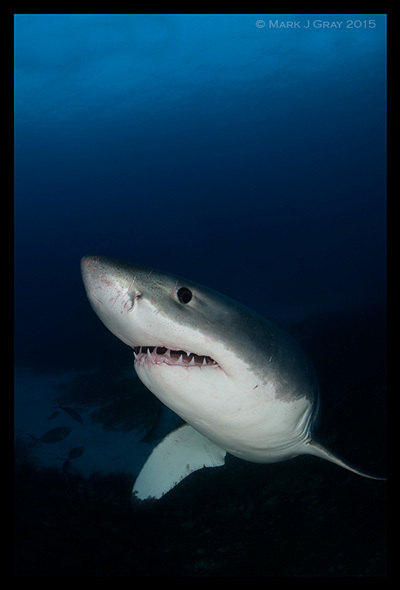 This is especially important when shooting more aggressive subjects because you need to know what the subject is doing and also spot any other hazards in the water (think open water shark diving). Shooting from the hip is highly recommend when shooting feeding Bull Sharks as they come at you in all directions. Beqa Lagoon, Fiji. There is a time and place when shooting from the hip can be very successful, and more often than not it is when the subject is close to you and comfortable with your presence. This includes interactions with sharks, rays, turtles, whales and other large animals. Shooting from the hip allows the photographer to move with the subject, providing the opportunity to shoot different angles that would not normally be possible. One-handed shots and positioning the lens for sunbursts on moving subjects are just a couple examples. Shooting from the hip takes some practice to master and having the right underwater camera setup will increase your image success rate. 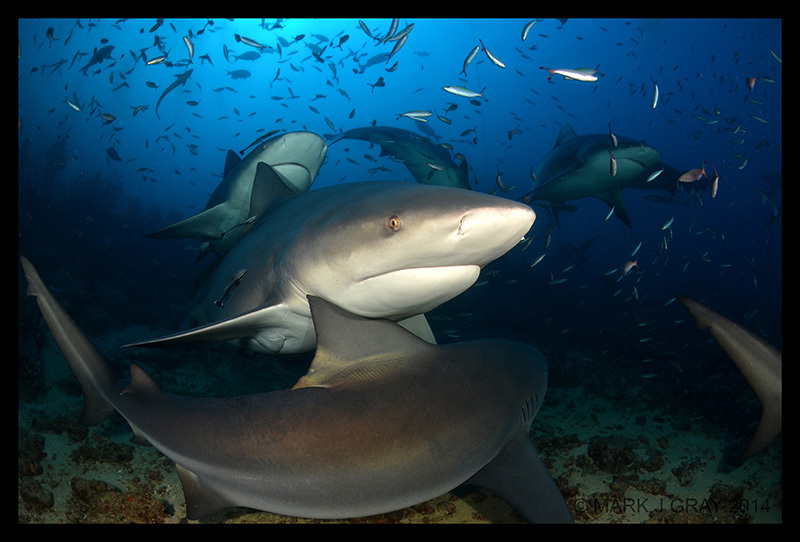 Grey Nurse Sharks of Fish Rock, South West Rocks, Australia. My success in shooting from the hip has come from having a camera setup that is suited for the task at hand. I like to use a fisheye lens because the 180-degree field of view allows the photographer to fill the frame with large subjects when they are close to the camera without cutting off parts of the animal, while also allowing a good spread of light from supporting strobe(s). This wide field of view is also very forgiving in the sense that it allows the photographer more chance of capturing the subject in the frame when shooting from the hip. Another benefit of modern fisheye lenses is their ability to autofocus very close to the dome port, which is essential with subjects that come very close. I prefer a larger dome port (8 inch or more) to balance my camera setup. Choosing a camera body that can shoot continuously is important when shooting from the hip. Since the whole idea behind this technique is to spend more time with your subject, you will want the ability to hold the trigger down with one hand and rack up as many good shots as possible before either the camera’s buffer bogs down or your strobe recycle time doesn’t keep up with the frame rate. 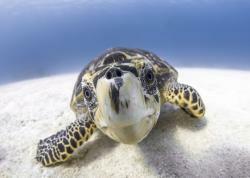 15-shot sequence of a Loggerhead Turtle shot from the hip whilst swimming in front of it. Byron Bay, Australia. Each camera and strobe combination has its ideal relationship between camera continuous frame rate, strobe power, strobe recycle time and camera buffer size. Remember to use a fast memory card. I have found that reducing strobe power increases the recycle time when shooting on continuous. The right strobe power will depend on the light needed and how many frames per second your camera shoots plus the recycle time of your strobe – there is no universal setting. Leopard Shark (AKA Zebra Shark) perfectly timed shot from many frames shot on continuous and from the hip. Byron Bay, Australia. Another important aspect of shooting from the hip is choosing the right autofocus setting. I have found that AF-S with single spot has produced the most accurately focused images on my Nikon DSLR. I have used the continuous focus setting (AF-C), which is suggested to be better suited for moving subjects, but have found that I was getting a lot more out-of-focus shots than with single focus. 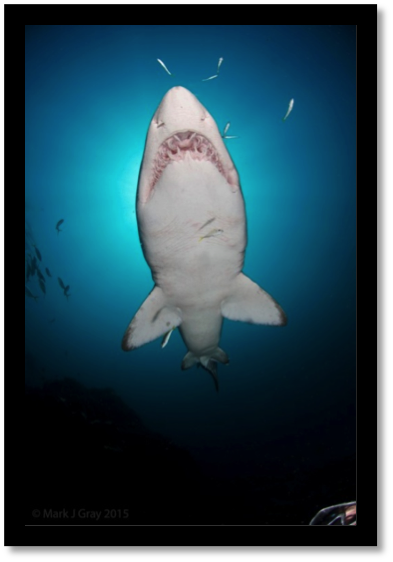 I adjust the single spot to line up with the dominate feature of the subject; for example, if the shark is moving right to left I have the spot towards the left, as it will line up with the shark’s head, allowing precise focus on the mouth and eyes. Another factor to be aware of with setting up your underwater camera is its balance and weight in the water. Having well balanced, almost neutral setup is a great help, especially when shooting with one hand and swimming along with your subject. Strobe position is another factor that must be considered if you are getting really close to subjects. I find that having my strobes in close and behind the front of the dome and angled slightly away from the dome allows good coverage of light on the subject, even at very close distances. Using diffusers produces nice and even lighting. This strobe position covers most wide-angle shooting and makes your setup slightly more compact so that you don't have to worry about strobes getting bumped out of position. Shooting Grey Nurse Shark one handed whilst swimming underneath. My face and mask seen in the bottom right hand corner. Once you have picked the ideal settings for your underwater camera setup, it comes down to diving and the ability to find and shoot your subjects. I think this is the most important part of the learning how to shoot from the hip as this is when you can try to create the image you’re after. Streamlining your dive gear and correct weight is an important part of diving in general, but even more so when you are shooting from the hip. You need the ability to focus on the subject and your photos without worrying about your buoyancy or having gear dragging on your surroundings. Moving in a streamlined and efficient manner allows you to get close to subjects - especially those that are shy and timid. A subject that doesn't feel threatened will stick around - often allowing you much more time to shoot. Being selective and finding these subjects will lead to the best photo opportunities. The Great White Shark requires caution especially when close to the cage. One hand on the cage door and another shooting from the hip. Neptune Islands, South Australia. Shooting from the hip takes effort in getting your camera rig set up for the task at hand and takes time to master. Through practice I have increased my success rate with more printable frames per dive that would not be possible while trying to look through the viewfinder. There is a time and place to shoot from the hip, so don't be afraid to apply some of these techniques on your next dive. 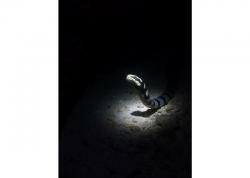 Mark Gray works for Sundive Byron Bay at one of the top 10 dive sites in Australia. 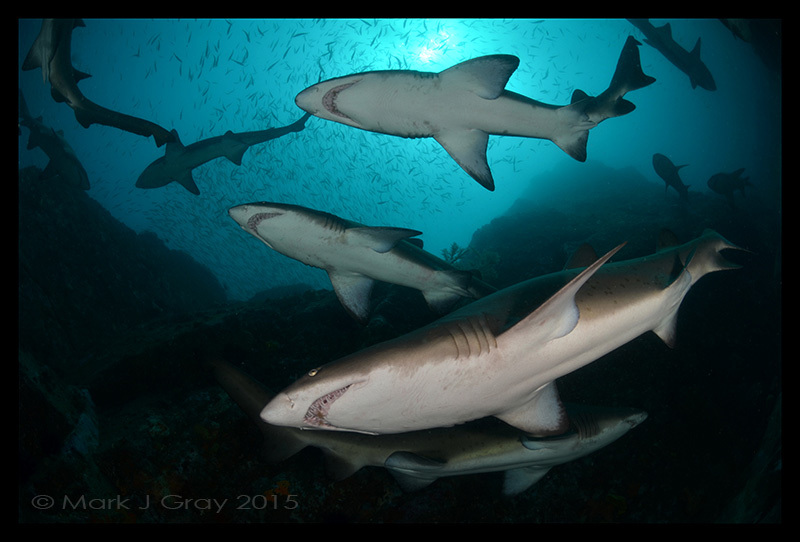 Over the past 12 years, Mark’s passion for photography has grown, especially involving the endangered Grey Nurse shark and its conservation efforts. 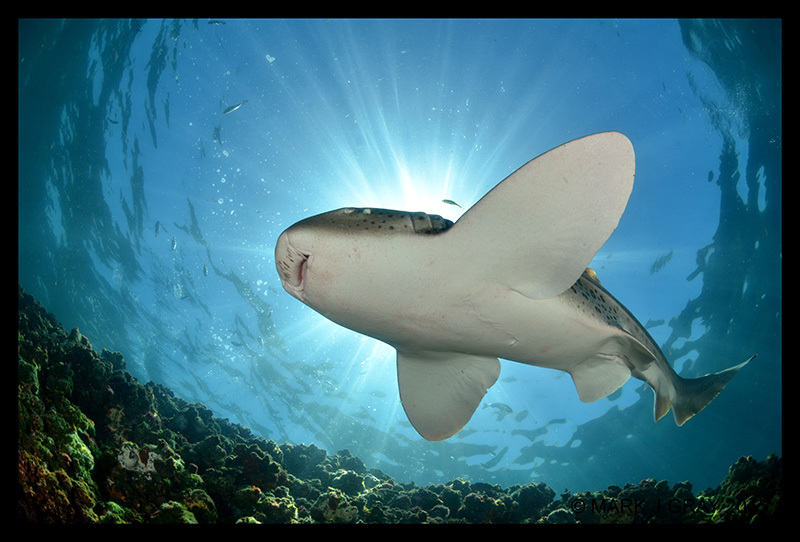 Mark has won several local awards and has recently been voted Photographer of the Year 2015 by Australian Marine Conservation Society. 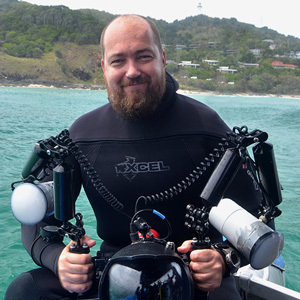 Mark’s passion is mainly wide-angle photography, and living near one of the Australia’s best dive sites allows for a large range of subject to choose and learn from.